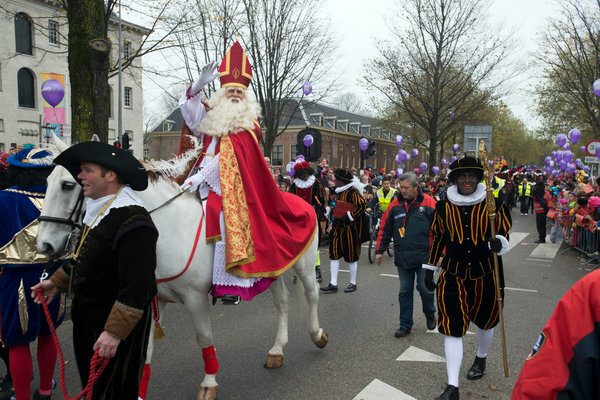 The Christmas season in the Netherlands begins in mid-November when St. Nicholas arrives with his companion Black Pete. They travel from Spain, where, according to the Dutch, St. Nicholas lives, to the Netherlands by steamship. Each year they choose a different city to visit. St. Nicholas and Pete disembark to a large parade put on by the city with floats, bands, and balloons. The parade is broadcast on television to the whole nation. At the end of the parade St. Nicholas addresses all the children at the parade and watching on television letting them know what he expects of them. Each night between St. Nicholas’s arrival and the eve of his day, December 5, children leave their shoes by the fireplace, or a window, or a door hoping Pete and the saint stops by to leave some treats. He usually visits at least once before his day and sometimes more than once. The main gifts for the children, St. Nicholas brings on December 5. More Dutch Christmas customs will be presented next month. Like many places throughout the world the Dutch have special recipes they bring out for St. Nicholas Day and Christmas Day. Below is a recipe for snowball cookies. Combine water, butter, salt, and sugar in a small, deep saucepan and bring to a boil. Boil gently until all the ingredients have melted. Remove from the heat. Add the flour all at once and mix rapidly with a wooden spoon to a smooth paste. Add eggs one at a time, beating thoroughly after each addition. Add currants or raisins and candied fruits. Heat oil to 375 degrees F and, with a metal spoon that should be dipped in the hot oil, drop the dough by spoonfuls into the oil. Fry 5-8 minutes or until puffed up and golden brown. Drain on paper towels and dust with powdered sugar.